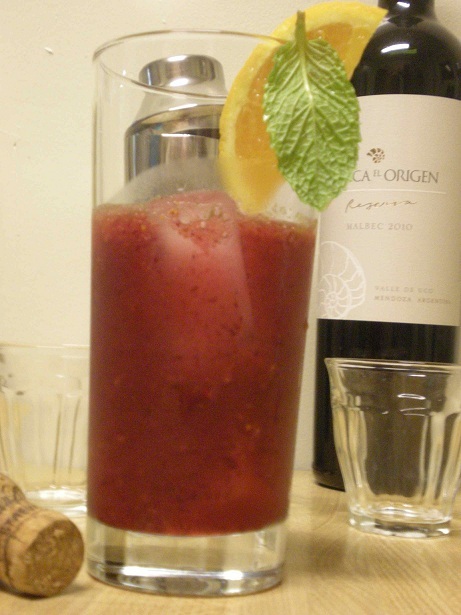 Blend everything until the drink has a liquid consistency, then strain it into a tall glass. Fruity drinks always remind me of the summer: sun beating down on the shores of turquoise water lapping at some sand, as you watch tanned beauties sip a Cosmo with those little chunks of sweetness bobbing at the top. Since we’re on the heels of the season, though, they’ve all but gone out of style. Reminiscing about the days we’ve since passed by, the two of us decided to make a ‘last hurrah’ drink before Ithaca plunges us into thirty weeks of night again. What better way to do that than throw some fruit and ice into a blender and hope for the best? Yet, we want everyone to enjoy this, not just the ladies (which is the stereotype, or so I’ve been told.) To make it more unisex-friendly, this drink has a nice bite to it without being bitter. It provides a fresh tinge on the way down too, courtesy of the mint. Beware, though; it comes out of the blender very pulpy and gritty, so strain it well unless you don’t mind drinking seeds and leaves. In the end, enjoy this drink as a requiem to summertime, or as a celebration to inevitable future lethargy.